Many more people are reporting seeing Google Sitelinks update, so I thought it would be a good time to revisit what Google Sitelinks are. See the five links that are indented under the main listing? Those are Google Sitelinks. 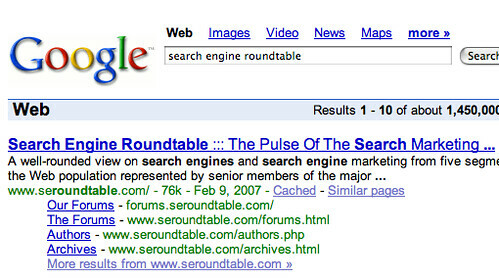 Google has a help document named How do you compile the list of links shown below some search results? that explains a bit more on how they work. Google formally named Google Sitemaps in September 2006. They’d been spotted and tested for well over a year before that, going back to at least July 2005. Social Patterns once tried to analyze what generates the exact links that come up, back before the feature was formally named. I suspect they are now based on the link popularity of your internal pages, mixed with how many internal links you have pointing to your inner pages added with the popularity from external links.